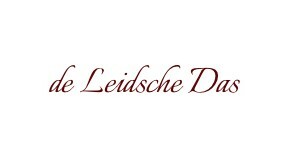 Neckties customization by the Leidsche Das. 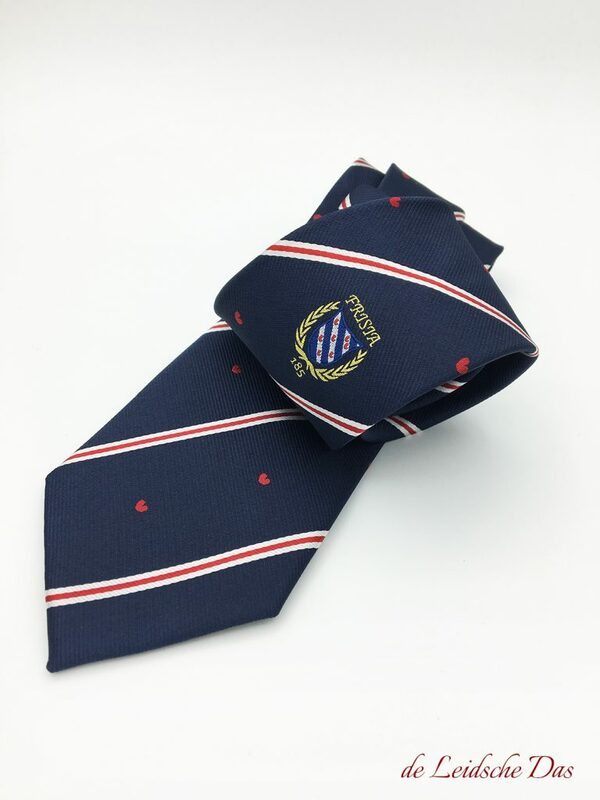 Neckties customization – Woven neckties custom made in your own design. 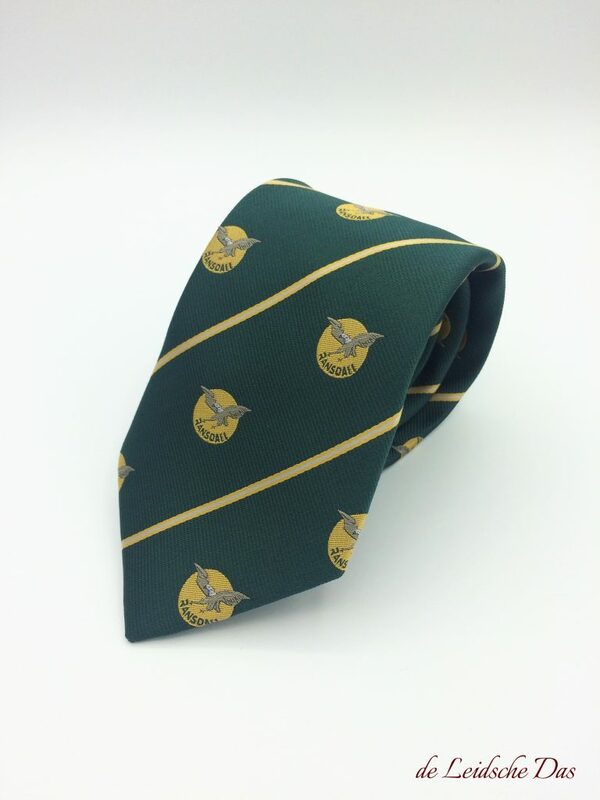 You want to have ties made for example company ties or ties for your club or organization. 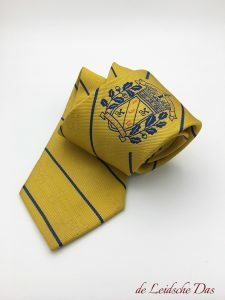 Because you probably don’t have ties made every day, you should of course first choose whether you want your ties printed, embroidered or woven. If you choose to have your ties printed or embroidered, you make the choice for prefabricated ties and that is not what we do! We weave the fabric for your neckties custom to the approved design by you. When the weaving process is finished we cut the fabric to the required size and then your ties are handcrafted. Now you may think that custom weaving is many times more expensive than having neckties printed or embroidered! We can only suggest to compare our prices with those of providers of printed or embroidered ties and we are sure that the outcome will surprise you. Neckties customization by us and what we do. Further on this page our free design service, our prices, minimum order quantity and delivery times. We start with the design of your ties. Good contact between you and our designers is essential during the design process. Let our designers know your wishes and ideas and they will be happy to help you create a unique necktie design. Do you want to have neckties designed and made? Then we invite you to make use of our free design service for neckties customization. Contact Necktie Free Design Service. Our design process for neckties customization. You have the following choices during the design process, The length and width of your neckties, the color(s) of the yarn used, your own custom designed pattern, the weaving structure of the fabric and the position(s) of your logo, image, coat of arms and/or text. We can make your neckties in microfiber/polyester and in 100% silk. Prices for neckties custom made om 100% silk. Our production time for custom made neckties in microfiber/polyester and silk after ordering. We are a Dutch company located in the historic city of Leiden in the Netherlands and we design and manufacture custom made neckties and bow ties in silk and microfiber/polyester for companies, army, schools, colleges, universities, organizations, (sports)clubs, societies, governments and political parties.